New Tang Dynasty Television (NTDTV)'s broadcasts into Asia have been disrupted since June 16, 2008, with some fearing that it is an extension of the Chinese Communist Party's media censorship. NTD is one of the few independent television networks broadcasting into mainland China and carries many reports on issues such as Falun Gong, Tibet, human rights in China, and the international movement to quit the Chinese Communist Party. The satellite provider, EutelSat, told the New York-headquartered station that their W5 satellite unexpectedly stopped because of a “technical anomaly,” and that they did not know when it could be repaired. EutelSat told the station that four of the five transponders for the satellite had experienced “an anomaly to part of its power generator subsystem,” which affects the operating transponders used by NTD and prevents NTD from using the alternate transponders. This incident has meant a complete shutdown of NTD's broadcasts into Asia. Media censorship is a huge problem in China. Even English broadcasts are frequently interrupted mid-stream for mentioning issues including human rights, Falun Gong, police brutality, Tibet, or democracy. The regime has owns foreign media and dedicates large sums of money to blocking information on the Internet inside of China. Chinese agents armed with guns assaulted Epoch Times Chief Technical Officer Dr. Peter Yuan Li in his home in Atlanta in February 2006. Dr. Li, a student of Nobel Laureate Cui Qi, had been developing techniques to break through the Chinese regime's Internet blockage. The thugs also stole two of his laptops. The Hong Kong Epoch Times experienced many problems trying to establish relationships with printing companies after the CCP continued to contact and intimidate firms. The Epoch Times had no choice but to purchase its own printing facilities that was then vandalized by four Chinese thugs in late February 2006. The thugs broke into the Hong Kong office of The Epoch Times, ,/a> smashing a glass door and damaging the printing equipment. Thugs also broke into the Osaka branch of The Epoch Times in Osaka,Japan on March 2006. A computer was stolen, but cash and other items were ignored. Japanese police said the thief had been collecting intelligence information. In March 2006, all the computers and monitors in the Taiwan Epoch Times central office were stolen, and all the company's information that had been accessible through the computers was lost. NTD is a primary target for the CCP because of its extensive news coverage of China and its broadcasts of the Nine Commentaries on the Communist Party. Given this, Eutelsat Communications would be a good company for the CCP to target. In 2005 Eutelsat told NTDTV that they would like to terminate their contract. 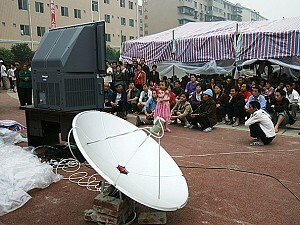 The International Federation of Journalists reported that the CCP had told Eutelsat to suspend broadcasting for NTD so the company could secure a contract for broadcasts during the Olympic Games. After strong protests from NTD viewers and the governments of various countries Eutelsat resumed its contract with NTDTV. The regime's news blockade impacted the SARS threat in 2003, and the seismologist's prediction of the earthquake in Sichuan Province this year. NTD's exposure of this sort of information has made them an enemy of the CCP. The CCP continues to make efforts to block information in the run-up to the Olympic Games. Short-wave broadcasts of Radio Free Asia and the Sound of Hope are also constantly disrupted.